I love me some figs. Alas, their season is short, and even then they're pricey as all get out. But when I saw this recipe in Bon Appetit, I couldn't resist. 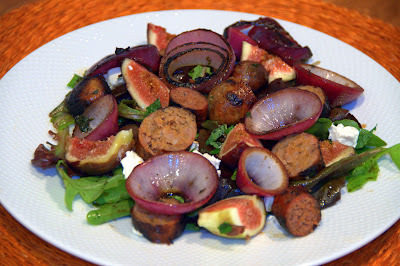 Lamb sausage and figs? Sign me up! I wasn't sure I'd be able to track down lamb sausage, but Whole Foods actually carries two different kinds. I opted for a spicy version, which we grilled up outside. Other than slicing up everything else, assembling the salad was a snap. Unfortunately the dressing was not quite as easy. As of late, pomegranate molasses seems to be showing up everywhere as an ingredient. Can't say I'd ever even heard of it before this year. I've tried to find it at stores, even on Buford Highway, but thus far no luck. i'm sure there must be a middle eastern market somewhere, but it seems like a lot of effort to go to for one ingredient. Instead I opted to make my own, by cooking down pomegranate juice and sugar. Even though I accidentally bought pomegranate grape juice, it still turned out well and made for a delicious salad dressing. This salad was absolutely flippin' amazing. Seriously. The spicy lamb, rich creamy cheese, sweet dressing and figs - it offered an incredible amount of flavor in every bite and made spectacular leftovers, too. It also looked lovely on the plate and would have been the kind of dish I'd be proud to serve company. Figs are nearly gone from the stores, though, so try this recipe stat!